I bought this book on a whim while visiting a newly opened journal / papergoods / travel lifestyle shop in Los Angeles a couple weeks back. The book was small, with the blurb, "The Founding Fathers tried to protect us from the threat they knew, the tyranny that overcame ancient democracy. Today, our political order faces new threats, no unlike the totalitarianism of the twentieth century. We are no wiser than the Europeans who saw democracy yield to fascism, Nazism, or communism. Our one advantage is that we might learn from their experience." Yes, okay, I'm interested, keep going. 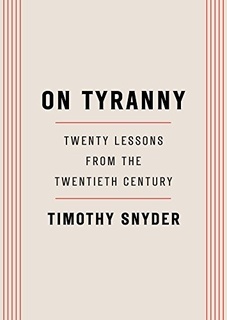 Turns out, the whole book was one big smack upside the head, complete with actionable items to do to help stem the tide of tyranny currently rising in our country. While reading the book, I wanted to highlight every passage, share all of the lessons with everyone, buy a million copies and send them out to everyone I come in contact with in all aspects of life. It is a fast read, 128 pages, so even people who don't read much or fall asleep while reading (read: many of my relatives) can finish it. The book reminds us that we are not special. Democracy has fallen many times in the last century, and we have the advantage of historical perspective to see what happened. We aren't coming into this blind, we can see what is happening. We can stop it. Others have, we aren't too late. So, yeah, I strongly recommend this book, it is incredibly worth reading. Let me buy you a copy, ebook or physical, I don't care which. I want you to read this book. 6. Be kind to our language. Avoid pronouncing the phrases everyone else does. Think up your own way of speaking, even if only to convey that thing you think everyone is saying. (Don't use the internet before bed. Charge your gadgets away from your bedroom, and read.) What to read? Perhaps "The Power of the Powerless" by Václav Havel, 1984 by George Orwell, The Captive Mind by Czesław Milosz, The Rebel by Albert Camus, The Origins of Totalitarianism by Hannah Arendt, or Nothing is True and Everything is Possible by Peter Pomerantsev. It is your ability to discern facts that makes you an individual, and our collective trust in common knowledge that makes us a society. Like Hitler, the president used the word lies to mean statements of fact not to his liking, and presented journalism as a campaign against himself. We are free only insofar as we exercise control over what people know about us, and in what circumstances they come to know it. Words written in one situation make sense only in that context. The very act of removing them from their historical moment and dropping them in another is an act of falsification. In the twentieth century, all the major enemies of freedom were hostile to non-governmental organizations, charities, and the like. Today’s authoritarians (in India, Turkey, Russia) are also highly allergic to the idea of free associations and non-governmental organizations. To Ukrainians, Americans seemed comically slow to react to the obvious threats of cyberwar and fake news. When Russian propaganda made Ukraine a target in 2013, young Ukrainian journalists and others reacted immediately, decisively, and sometimes humorously with campaigns to expose disinformation. People who assure you that you can only gain security at the price of liberty usually want to deny you both. Similarly, it is none too difficult to imagine choices that increase both freedom and safety, like leaving an abusive relationship or emigrating from a fascist state. It is the government’s job to increase both freedom and security. When the American president and his national security adviser speak of fighting terrorism alongside Russia, what they are proposing to the American people is terror management: the exploitation of real, dubious, and simulated terror attacks to bring down democracy. Courage does not mean not fearing, or not grieving. It does mean recognizing and resisting terror management right away, from the moment of the attack, precisely when it seems most difficult to do so. A patriot, by contrast, wants the nation to live up to its ideals, which means asking us to be our best selves. A nationalist will say that “it can’t happen here,” which is the first step toward disaster. A patriot says that it could happen here, but that we will stop it. Eerily, when judges said that a parliamentary vote was required for Brexit, a British tabloid called them “enemies of the people”—a Stalinist term from the show trials of the 1930s. In his 2016 campaign, the American president used the slogan “America First,” which is the name of a committee that sought to prevent the United States from opposing Nazi Germany. The habit of dwelling on victimhood dulls the impulse of self-correction. Since the nation is defined by its inherent virtue rather than by its future potential, politics becomes a discussion of good and evil rather than a discussion of possible solutions to real problems. itself. History allows us to see patterns and make judgments. It sketches for us the structures within which we can seek freedom. History permits us to be responsible: not for everything, but for something. One thing is certain: If young people do not begin to make history, politicians of eternity and inevitability will destroy it.